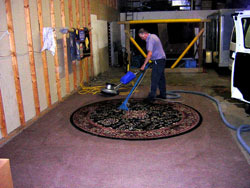 We clean your oriental rugs at our cleaning plant in a controlled environment, ensuring a safe and thorough cleaning. 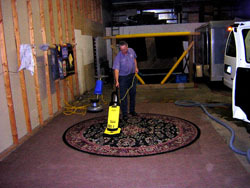 The first step of our oriental rug cleaning process is a careful vacuuming of both sides of the rug. Next we agitate and shampoo the rug with a rotary scrubbing machine, emulsifying dirt and oil. 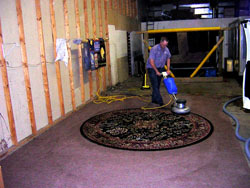 Then we clean the rug with hot water extraction, rinsing the rug clean and removing the soil and stains. After the cleaning is finished, the rug is hung on a specially designed rug drying rack to allow fast drying to both sides of the rug. Rug pick-up and delivery is available.